www.photomacrography.net :: View topic - FAQ: How do I get a bit more magnification? FAQ: How do I get a bit more magnification? 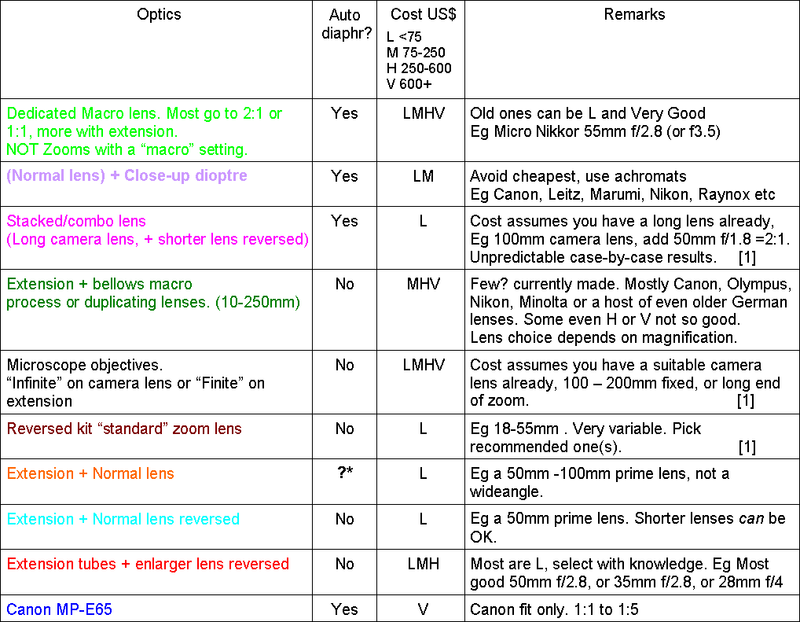 Posted: Tue Sep 16, 2014 8:49 am Post subject: FAQ: How do I get a bit more magnification? Many starting members ask how to get more magnification than their current equipment. Be warned this can be like having a more powerful motorcycle. It might flip you over backwards as soon as you fire the engine. Then once you’ve mastered that, you come off at every corner. Start slowly or you’ll go nowhere fast . More magnification means more struggling with all the usual problems of movement, lack of depth of field, lighting (both lack of, and diffusion requirement) which will cripple your efforts faster than lack of optic power. Those problems all get harder when you go closer, so getting more magnification is likely to be very discouraging unless everything else is under control. Extension :....................Can be by extension tubes, or bellows. *Extension tubes :........Auto/dedicated extension tubes will keep an auto diaphragm, manual tubes or bellows will not. Adapters :.....................Most of the above lenses will need adapter(s) to go between makes, reverse a lens or fit a lens thread. Canon EF lenses : ........Aperture not alterable once it’s reversed. Adjust aperture on the camera then remove lens. Combinations :..............Extension tubes, close-up dioptres, or teleconverters can be added in combination but quality may suffer too much. Working distances :.......Will very widely between different methods. Note  :.......................Chance of vignetting or very poor corners of the frame. Since this was written: A lot of work has been done, testing lens combinations. Some "Combos" in particular have shown spectacular results while most are easily beaten. Searching in the forum will find some of those. Smaller formats have more to gain. How do they work out? For an APS sensor 23.2mm wide, 2:1 means an 11.6mm field of view. The lines are intended to indicate about the best you're likely to get with a suitable lens chosen for a particular magnification. An exceptional lens or exotic one costing thousands will beat the curve. Some allowance has been made to indicate convenience. Some are obsolete but commonly available used. Check the forum for comments about specific lenses. An "ordinary" enlarger lens for example, will be noticeably less good than the best. "Excellent" is a moving target. As sensors develop we expose more differences between the best lenses. This is a short guide, only, based on personal experience and some consensus between reviewers. Please use the forum "Equipment" section to discuss specific examples rather than this FAQ. Links can be added to this post by the Admin team. (8 +1) x 4.5, which is f/40.5, so you would expect it to look "soft" due to diffraction. Whether it's better to open a lens to maximum depends on the lens, and the trade off between aberrations and diffraction. FAQ: How can I hook a microscope objective to my camera? Why do you need the MPE when a reversed lens does the same? Something I didn't consider when writing this is a teleconverter. They can work well if the prime optic is very good. If it's not, they just make the middle of the picture bigger without revealing any more detail. A 2x converter will double the magnification while keeping the same working distance. You will lose 2 stops though. Best application is probably with a good macro lens. They can also "fill the frame" used on a lens combo which otherwise would vignette. Most wideangle, retrofocus prime lenses are disappointing when reversed. Those designed for close focus, work better, a few are particularly good. Try what you have, but seek advice before buying. some better-than-expected results have been published from SOME reversed 50mm f/1.8 camera lenses. They probably vary considerably, so try yours if you have one. while most cheap lenses are still terrible a few have come up which are particularly good, across all of an APS sensor. (See tests in the Equipment thread). These certainly challenge the value of the Canon MP-E65 in studio use on cost grounds. Be careful if you're using full frame, most don't cover that, which is why I put the MPE line as high as I originally did. A caveat: New lenses are coming out all the time, but some very good ones are discontinued. Plus, there are exceptional lenses costing thousands which do a very specific job very well. I'm not covering those here. Also there are a few very good lenses used in for example old scanners, but they have no diaphragm and no means of mounting, so hardly worth including here. The Venus 60m f/2.8 Ultra Macro lens has entered the scene. Its main innovation is a means for non-Canon users to get closer than 1:1, as it'll go to 2:1. NB it's all manual though, no auto diaphragm. Reported to beat a Canon MP-E on APS.